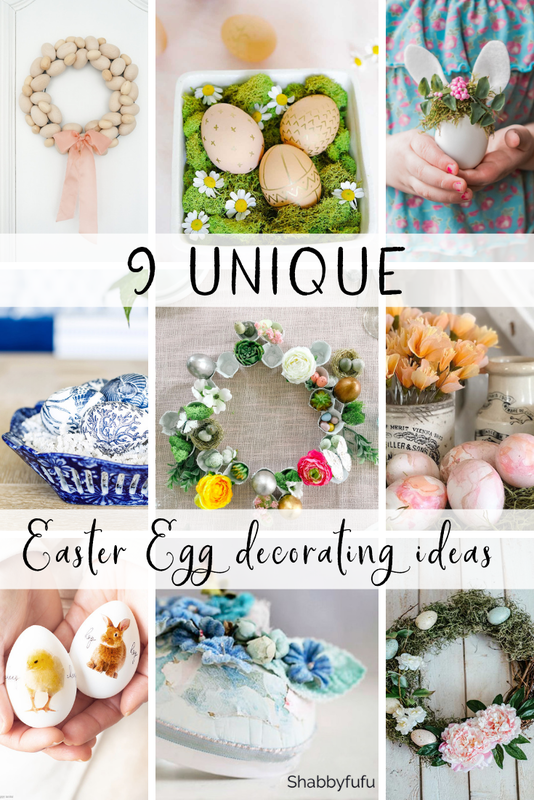 Today I am thrilled to be part of a blog hop featuring eight other bloggers and some really great easter egg ideas. Be sure to scroll to the end of this blog post to find photos and links to all of their projects. My accent spring color in our home this year is orange. 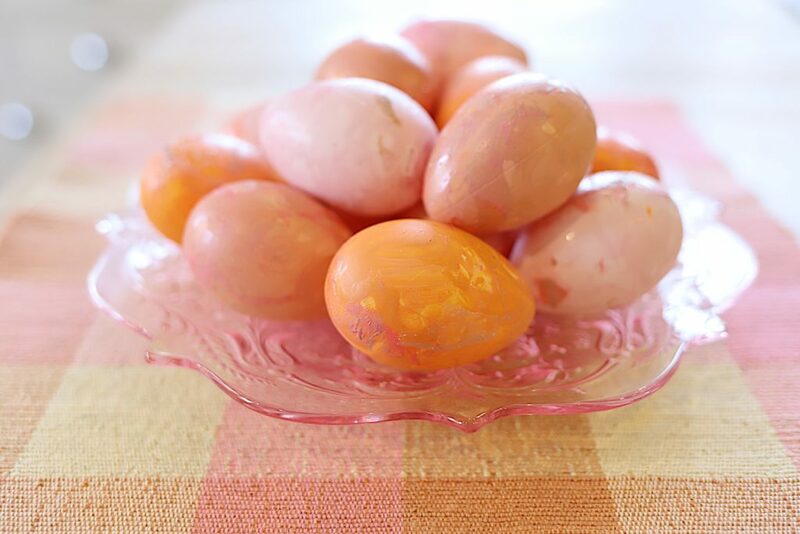 So I chose orange and pink as the color palette for my eggs. Obviously, you can use any color palette you want. I just caution you to stay away from the really bright colors of nail polish. 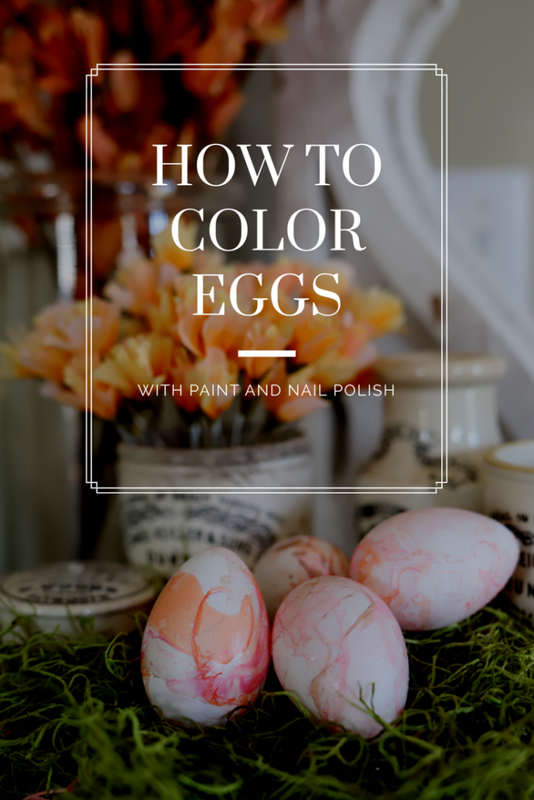 The neon colors can be tempting but remember how bright they will look on your eggs. 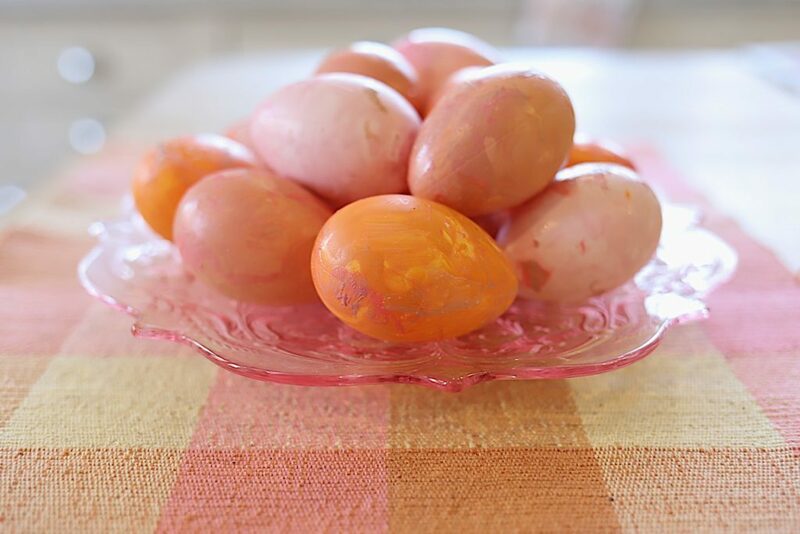 To color the eggs, fill a disposable bowl with about one inch of water. Add a few drops of nail polish. 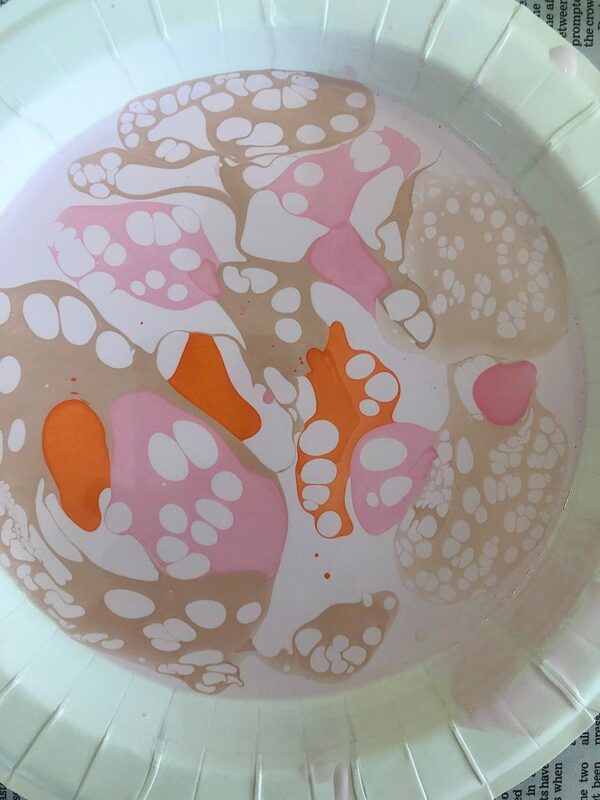 Your goal is to get the nail polish to rest on the top surface of the water. Here you can see I added drops of a second and third nail polish color. 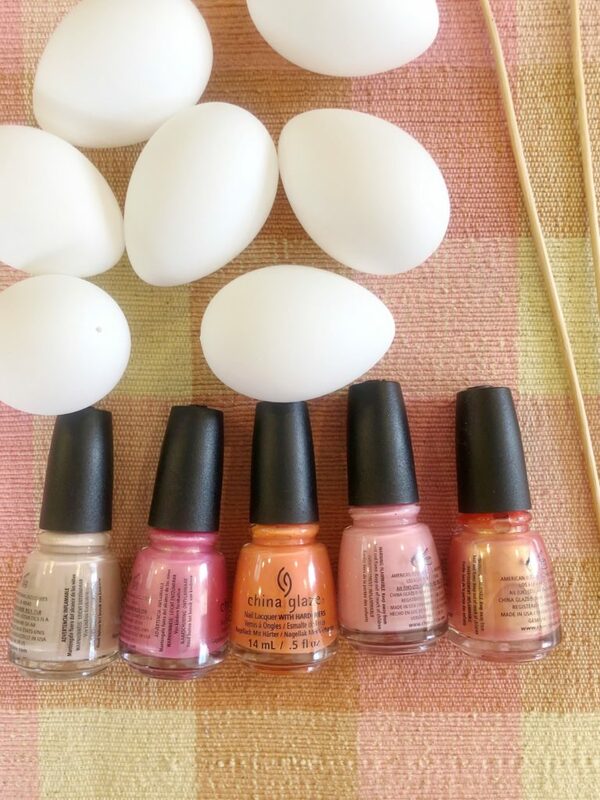 Using plastic gloves, roll the egg on the water surface to adhere the nail polish to the egg. Keep rolling until it is covered. I do have a quick tip. You need to change bowls and water after each use. 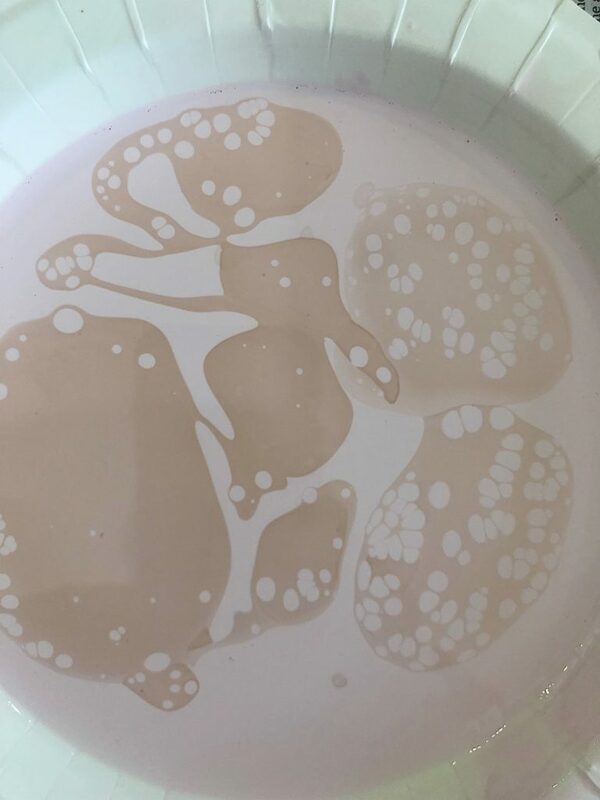 If there is too much nail polish residue, the nail polish won’t rest on the surface when you add it to the water. 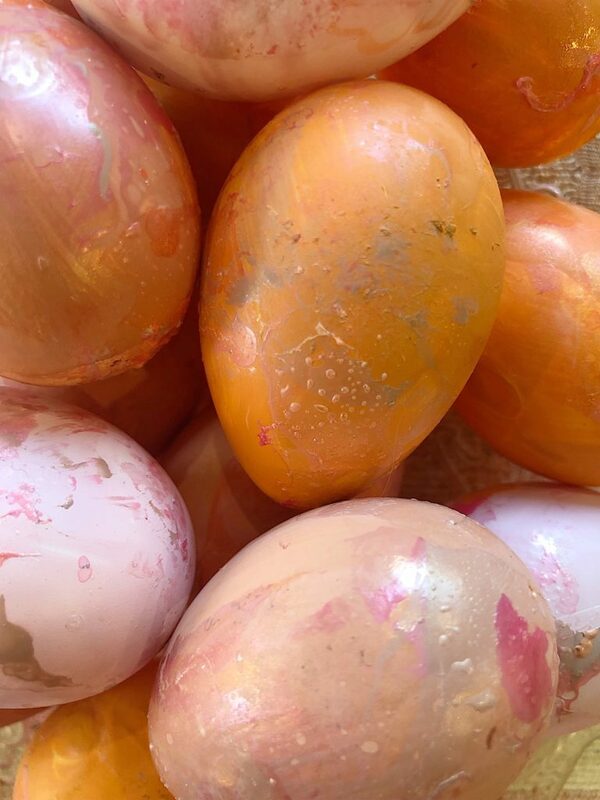 Don’t these eggs look amazing? They almost look like they have tissue paper on them. 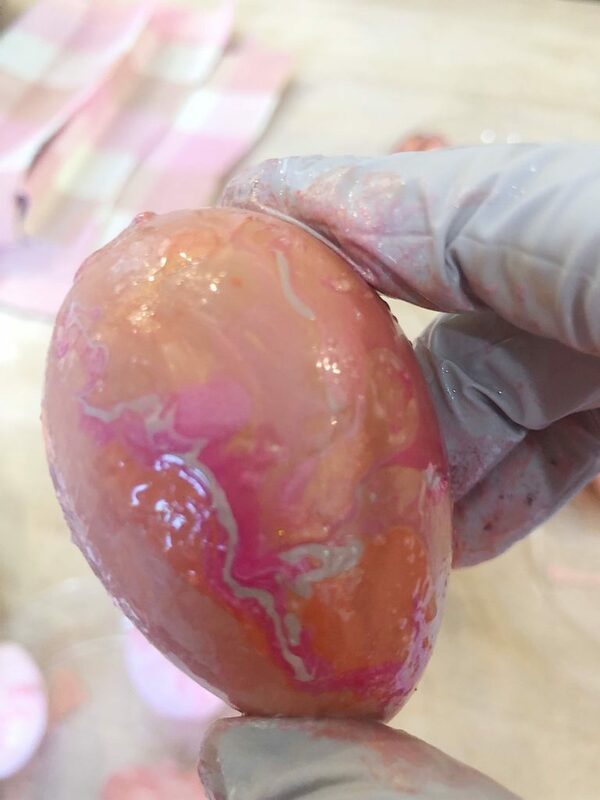 Next, I decided to paint the eggs with acrylic paint before I used the nail polish painting method. 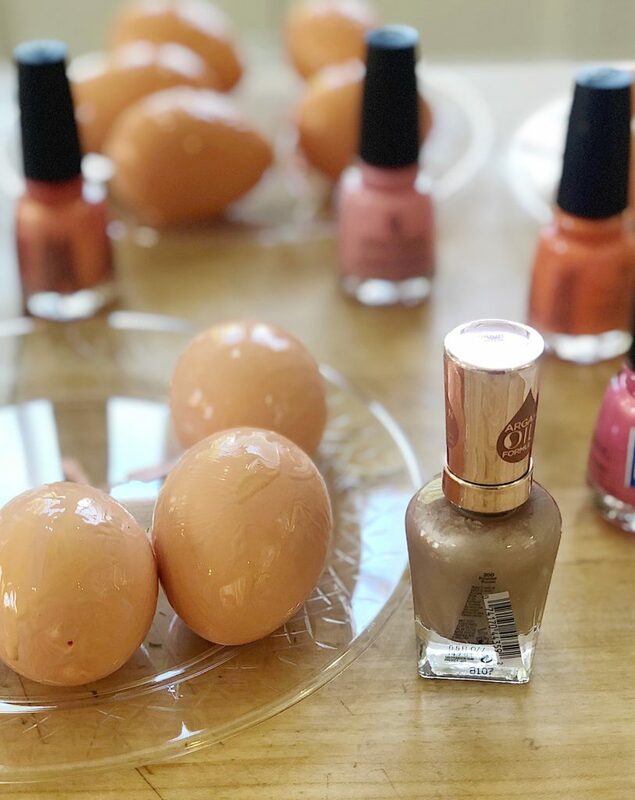 I love how the nail polish looks adhered to the painted egg. 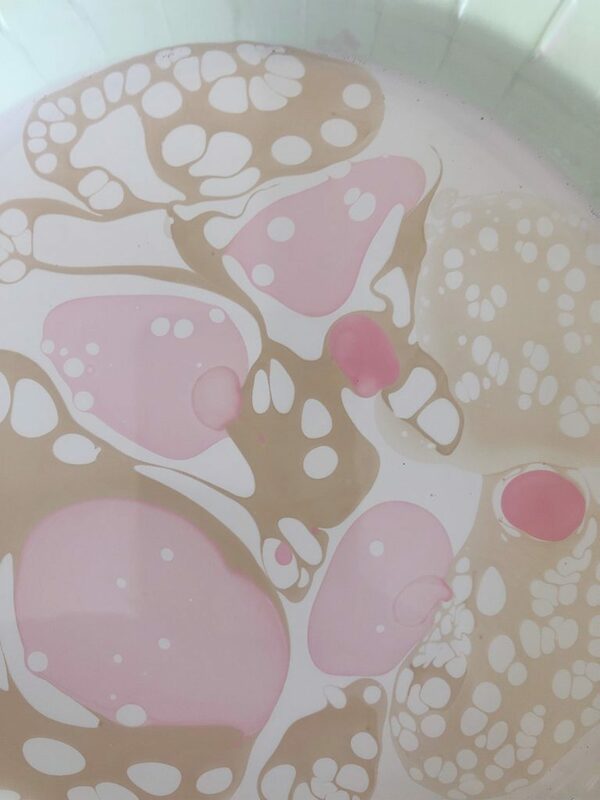 Once you have dipped them in the nail polish just set them on a plastic plate. Don’t use an egg carton because the egg will stick to the surface. Trust me, I found this out the hard way. 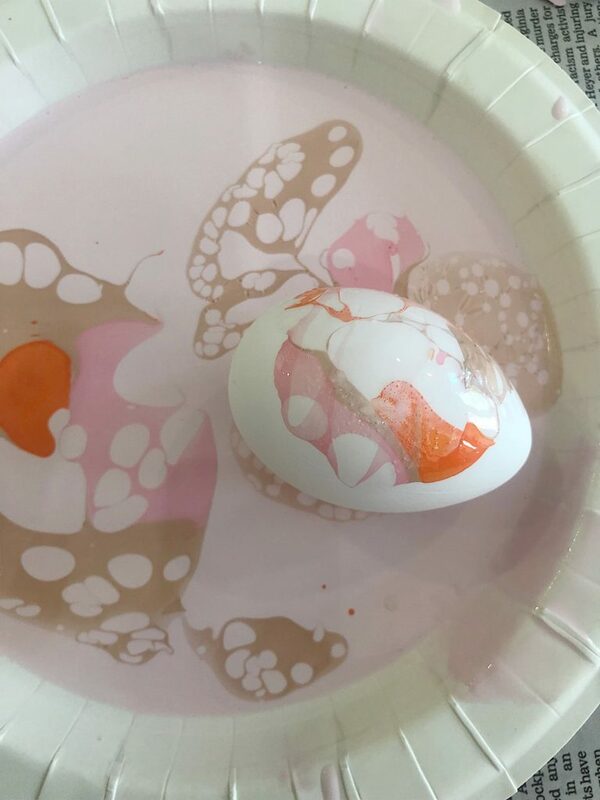 Here is a close up look of the painted egg version. 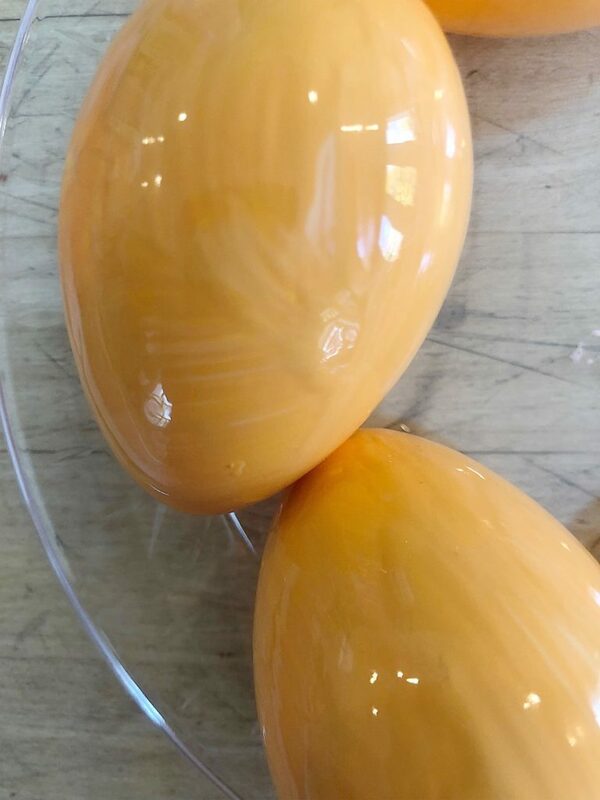 Although it is faster to make the eggs that aren’t painted, I am glad I made them both. Of course, I can’t decide which ones I like the best. 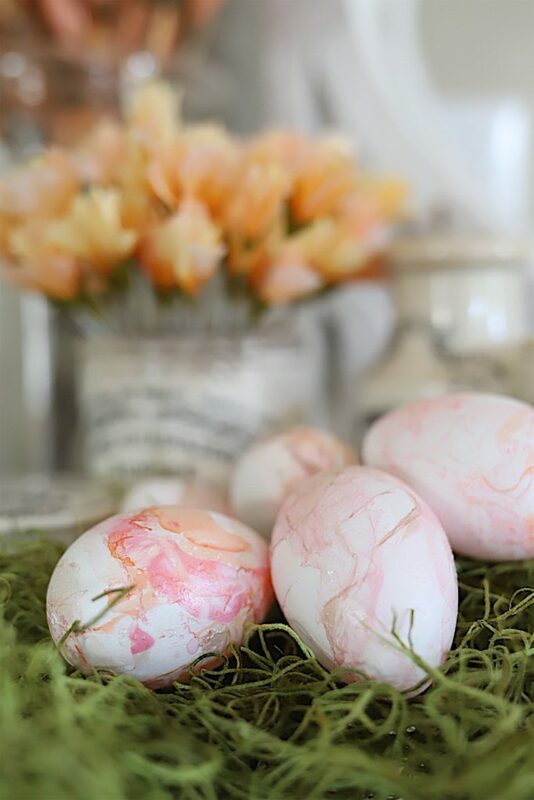 Be sure and pin my image to your Craft or Easter Boards on Pinterest. 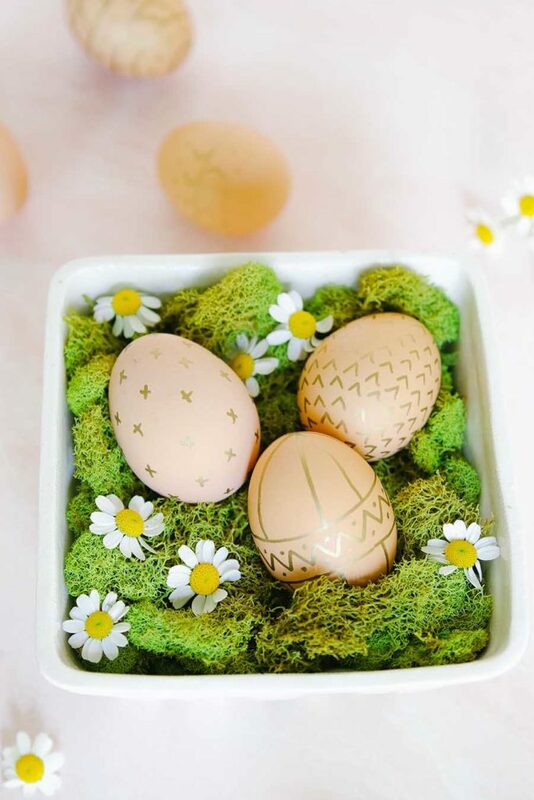 Today I’m joined by a fabulous group of blogging friends who are also sharing their Easter Egg DIY ideas. 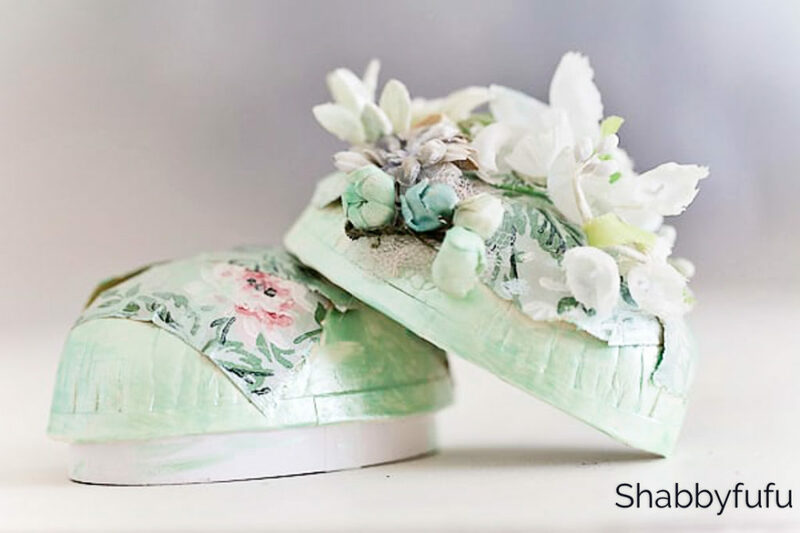 I am so lucky to be part of a blog hop. You aren’t going to believe all of these great ideas! 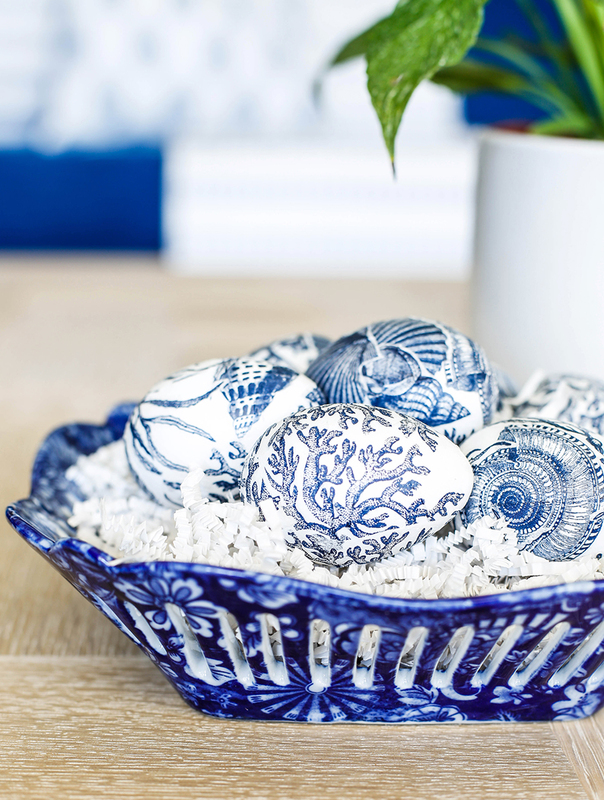 Tana created a blue and white easter egg decoupage decorating idea. These eggs are amazing. 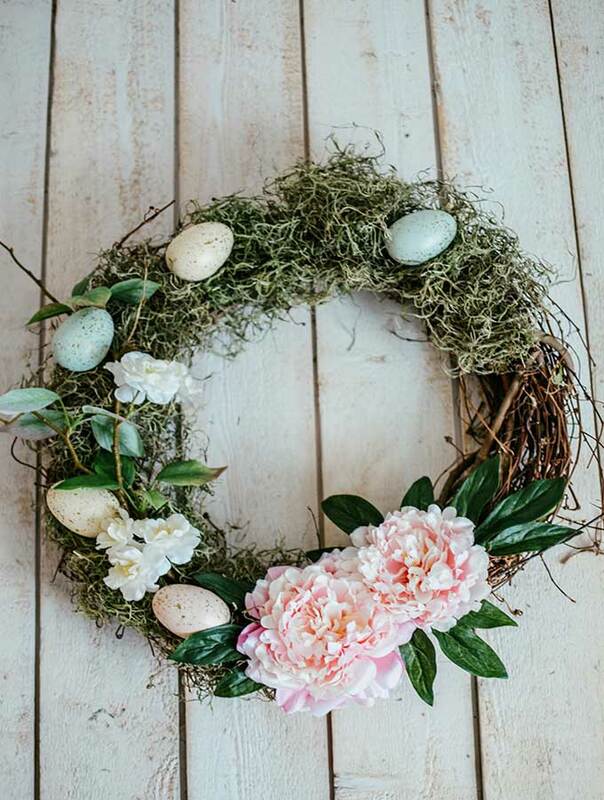 Jackie at Finding Lovely made this wonderful Wooden Egg Wreath. Rhonda made this lovely egg wreath. 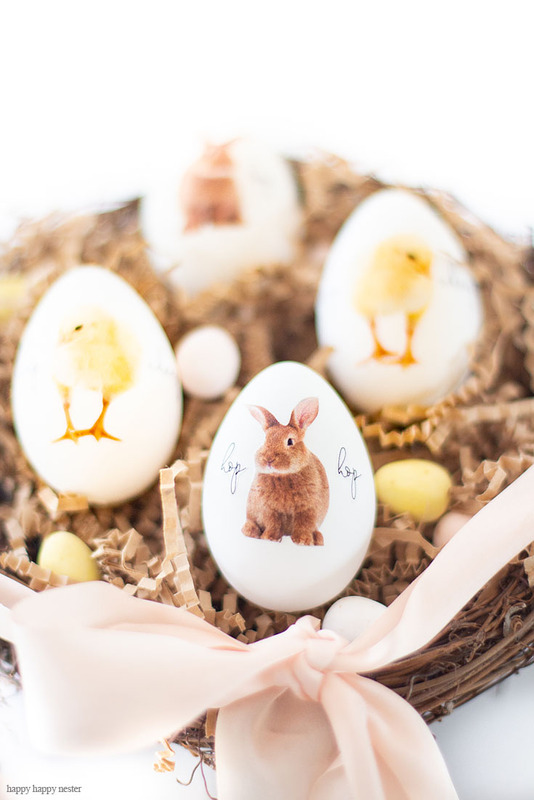 Janine made these adorable chicks styled easter eggs. Christina is so talented! 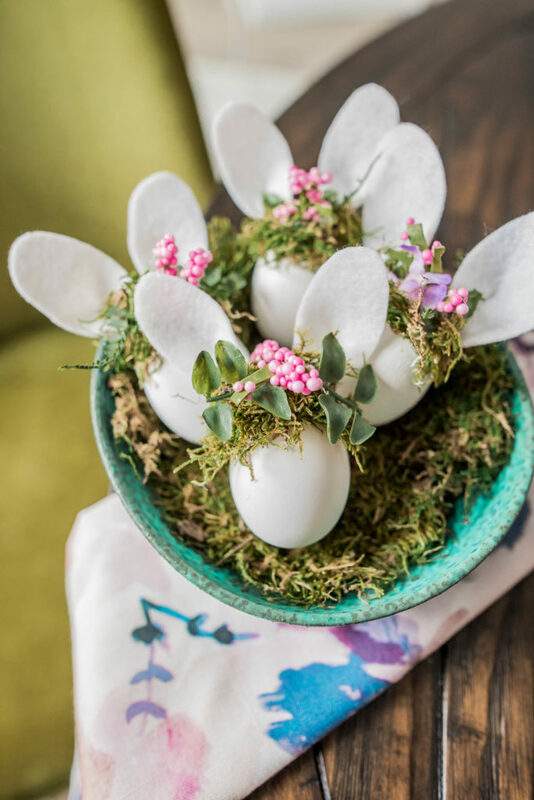 She made Easter Bunny Eggs with Tiny Floral Crowns. 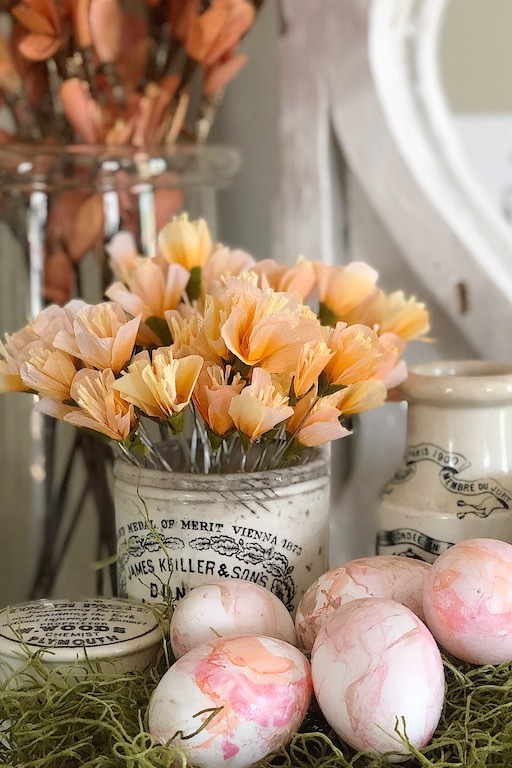 Janet did a great job creating her Easter Crafts by creating Vintage Flowers Easter Eggs. 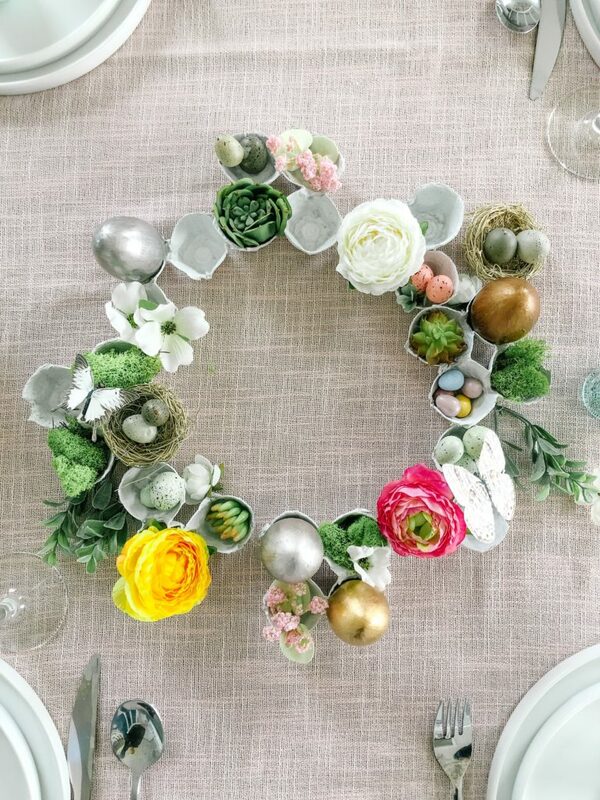 Jennifer designed this intricate DIY Gilded Easter Eggs Carton Wreath. 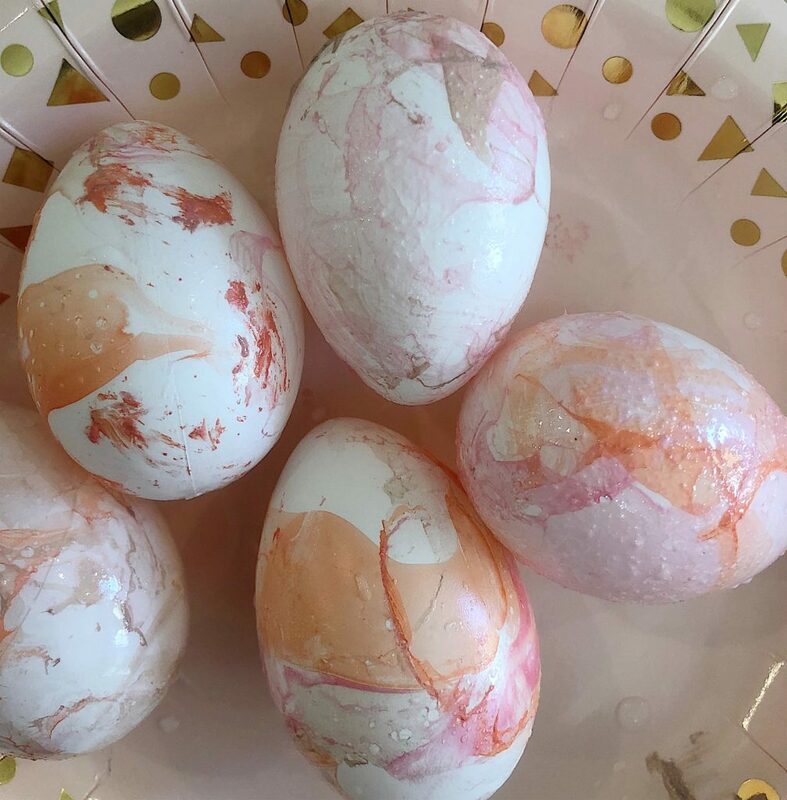 Ashley did a great job Decorating Brown Eggs for Easter. 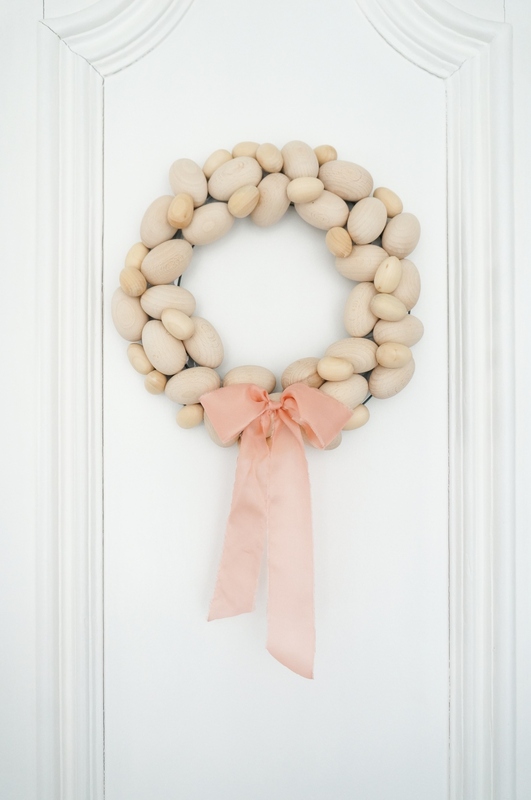 Be sure and pin this on your Pinterest Easter ot Craft Board! They are really beautiful! I have to say though, that I hope you are not pouring these bowls full of water & polish down the drain. 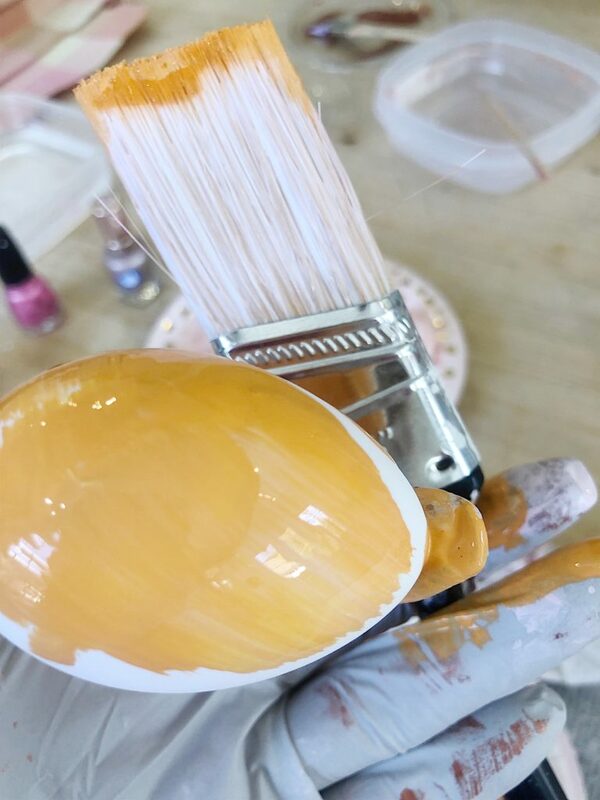 The EPA considers nail polish to be household hazardous waste (HHW) due to the toxic chemicals it contains, as well as being highly flammable. This means we can’t pour it down the drain (nor are we supposed to toss bottles in the trash unless we have emptied them onto newspaper and let that, as well as the polish remaining in the bottle, dry). I must try this! I love the marbelized effect it gives off…so cool! Leslie these are awesome! And my favorite colors too! I can’t wait to try this when the kids are asleep! Haha! If you try it, let me know what you think. I can’t wait to see what you do. You will have to try it! Awe. That makes me happy! My hens lay blue eggs, this would look amazing using them! Oh my gosh! It really would.